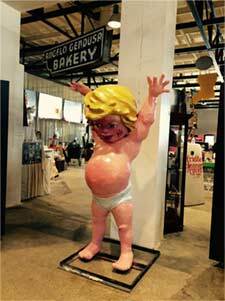 Our beloved Baby New Year, who proudly perched on the corner of the rooftop of the JAX Brewery Condominiums on New Year’s Eve, has retired and now resides at the Southern Food and Beverage Museum, located at 1504 Oretha Castle Haley Boulevard in New Orleans. Born in 2000, Baby New Year was found floating in the Barth Brothers’ den where he had been created and survived Hurricane Katrina. He was last seen on New Year’s Eve 2015. In his retirement Baby New Year plans to host an exhibit about traditional New Orleans foods—such as black-eyed peas, his favorite, which are eaten on New Year’s Day for good luck. He may even snuggle up with the king cake babies in a king cake.